Although this is should be obvious, since the iPod Touch comes with Safari, I've found to my pleasure: you can run bookmarklets through Safari (mobile). This means either I set up the bookmarklet on my desktop Safari and sync it across, or just spend a couple of minutes adding it manually. Sadly, but as expected, importing the vCard doesn't work :-( (certainly not on the iPod Touch - I'd be interested to hear what it does on an iPhone). 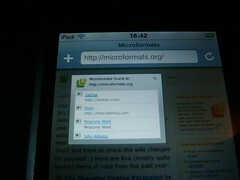 I also spotted the overflow style on the inner white div isn't working on the iPod (a bit of debugging may fix that). As I said in the description on Flickr above, it might be worth adding the option to expand out all details, and even detecting the iPhone/Touch and adding support for phone links.